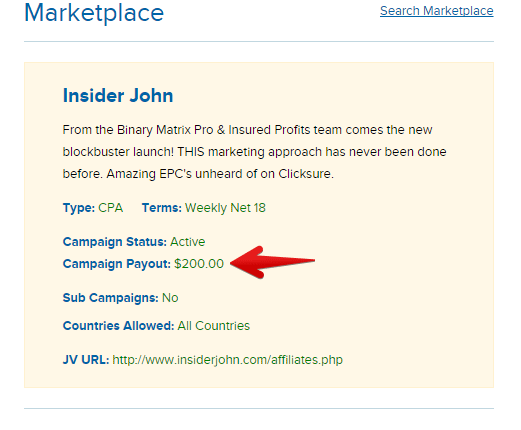 Work From Home Warnings Insider John Review – Is His BinaryApp-810 Real? 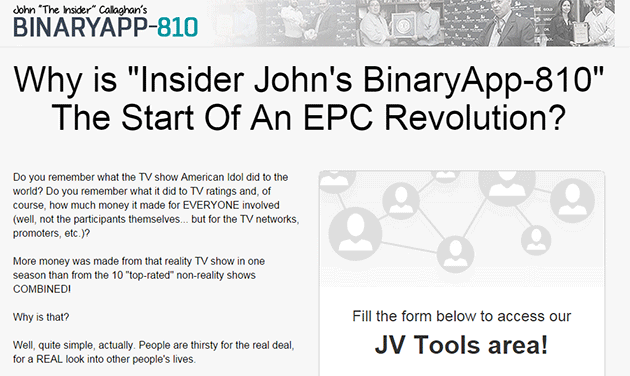 Insider John Review – Is His BinaryApp-810 Real? I’ve reviewed a lot of binary software programs, and Insider John is hands down the cleverest of them all. Hold your horses though, don’t go and sign up just yet. John “Insider” Callaghan takes us inside his life and shows us the awards he wins for his Binary Options program “Binaryapp 810”. In the opening video, we see him outside the Banc De Binary building on his way to accepting an award for number one binary app. Later on, while teaching us a little about the money his app has earned him, we seem him accepting two more awards. We’re led to believe then that Binaryapp 810 is THE software app for successfully making money trading binary options. Unfortunately though, this is after all, just a marketing approach. Binary Options are real ways of trading, but they are more like gambling. You log-in to a broker account, and place a bet on whether the price of a stock will rise or fall over a short period (usually a few seconds). If you’re right, you win, if you’re wrong, you lose. 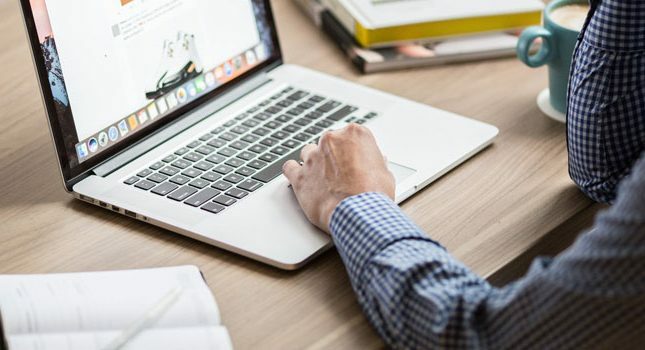 This kind of trading has given rise to a string of programs that claim to be software that will automate the process for you, and win every time. Some of them pretend that they only win 99% of the time, so that you think they are more legit. They do this because the brokerage companies will give a commission of $250 or more to anybody who refers a customer and gets them to add funds to their account. Therefore, they give away some “free software” junk to you, you join the brokerage and add funds, and you don’t win because the software is useless. You’ll also find that in most cases you’re not allowed to withdraw your funds again afterwards. They get their commission though, so from their point of view it’s well worth all the trouble of deceiving you. How Do I Know Insider John’s BinaryApp-810 Is The Same? Well for one, it’s a binary app. Did you not read the paragraph above? All of these things are the same. In fact, Insider John was created by the same team that have already made TWO other crappy programs. I’ve reviewed both of those products, and they’re both the same. Here is Binary Matrix Pro, and here is Insured Profits. So you see, they aren’t focused on telling people how the product WORKS. They don’t care about whether people really get rich off it. No. 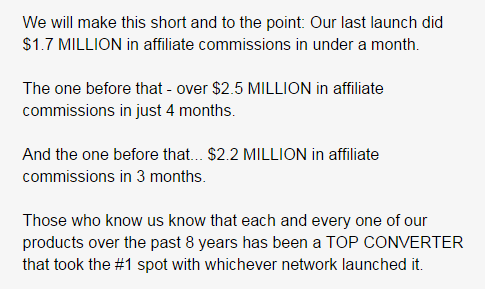 All they care about is finding affiliates to help them promote it, before they go back to the drawing board and produce another crappy Binary product to launch in 2015. Just another guru launch. Sorry to disappoint you. But What About The Awards? What awards? The whole “reality-tv” approach is very clever, and John does indeed walk into the Banc De Binary building (which is in Cyprus, suspiciously enough), but then it cuts to him in some random room with a very small group of people. In fact, all three of the “awards” look terribly thought out with bad acting. On top of that, when you search on Google for the Banc De Binary awards, or even the BigOption2012 awards, or the other one he claims to have won, you come up completely blank. No mention of any awards, and certainly no mention of him. Surely this would be all over the news? 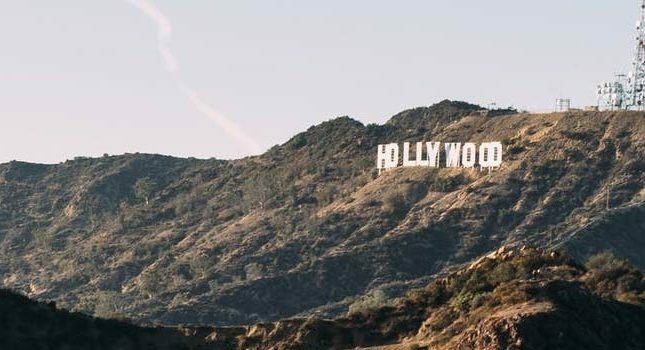 There’s nothing there, because the awards are just part of their clever marketing trick. Fool you into thinking they’ve created a foolproof software, so that you foolishly deposit funds, earn them a commission, and never see your funds again. That’s a lot of “fool” in there, so you better stay away.